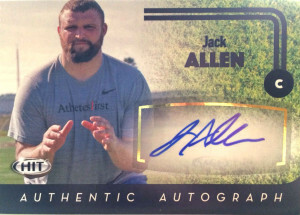 Jack Allen is one of the top offensive linemen in a loaded draft at center. The road grader traces his roots back to organized wrestling and displays good hands and mechanics because of it. While not the biggest prospect, Allen clearly can hold his own, and is considered pro ready. Considered a sleeper find the New Orleans Saints signed Jack shortly after the 2016 NFL draft.